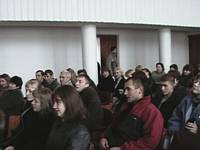 Since November of 2001, Family Aid International has hosted a number of Christian Business Seminars in the cities of Kiev, Chernihiv, Kremenchug, Pereyaslav, Bakmach, Konotop, Romny, Slavutich City, Mirgorad, Boryspil, Odessa, Smila, Nickolayiv, Kherson, Simferopol, Sevestopol, Yalta, Uzhgorod, Stri, L'viv, Sumy, and Kharkov. Thousands of interested people and business people have attended these seminars that teach charactor, leadership and marketing skills. The purpose of these seminars is to establish Biblical principles of business and success. If Ukraine is to break free from the poverty brought on by over 70 years of Communist rule, it will be Christian business leaders who lead the way. Teaching prosperity can be a touchy subject, especially if you are among religious people who have little understanding of God's plan and purpose. We present the subject in a balanced manner, using Genesis 12:2 as one of several key scripture references: "You are blessed...so you will be a blessing." God does nothing without purpose, contrary to the belief of a large portion of the Christian faith. His purpose in blessing us is NOT that we can consume it upon ourselves but rather that we in turn be a blessing to someone else. Its pretty simple yet mostly misunderstood. So misunderstood, in fact, that in some circles people make "vows of poverty." I have seen poverty and it does not bring Glory or Honor to our Lord. In fact, studies in social behavior indicate that it is poverty that leads to crime and other anti-social behaviour. Incredible isn't it? We believe God is raising up a new generation of business people in Ukraine whose heart and purpose is to support the advancement of the Kingdom of God. 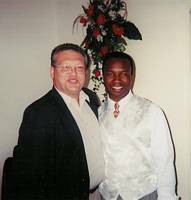 One of the main theme's of the conferences is from I Chronicles 29: 3 where it is recorded that King David said, "Because I have set my affection (heart) for the house of my God, I have given from my personal treasury (bank account)..."
Sunday Adelaja, Pastor of Embassy of God church in Kiev, has endorsed the business seminars as a powerful tool to release God's blessings in Ukraine. "The Truth of the Word of God will break the hold of poverty and release the Blessings of God to the people", one church leader commented recently. "I, Andrei Berezenets, write to you with big and sincere honour. I am not very good in writing letters but this letter I write with a big pleasure because it's aim is to share with you the thoughts that visited me after the business-conference that you held in Kiev on the 1st of June. God used your mouth to put in my heart new things that from that time on are always in my mind. Practical principles of marketing totally changed my understanding of business. 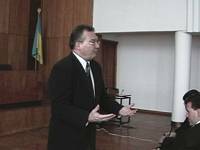 When I listened to your teaching about principles of marketing, every phrase and example made me realize more and more how much this teaching is important for Ukrainian businessmen of this time. If we use practically what we heard at the business conference, I am sure Ukrainian economy will be able to develop as fast as American. I believe that it's the reason why God called you to Ukraine and gave You a revelation about the future of Ukrainian economy." On May 23rd, 2003, The book, "Don't Be Afraid To Start Your Business" was released in the Russian language. The printing of this book was a over a year in the making as several Buisness Seminars were video taped, transcribed and translated into Russian. Church and business leader who has seen the book have been enthusiastic about it's potential to teach Ukrainians practical business skills from the Chrsitian perspective. "We want to express to you our gratitude for the time which you conducted the business seminar in Odessa. This was large blessing from the Lord for us and gave us confidence that we on a correct path." Read the forward, written by Pastor Sunday Adelaja, of the book by clicking here. If you would like to participate in a Business Seminar, please contact the Family Aid International office.